If you enjoy seeing your data in graphic form – not just drab tables or bland bullet points – you’ve got to check out a website called FlowingData. Nathan Yau, a PhD candidate in statistics at UCLA, publishes the site – a wealth of interesting pictures. Investor relations people and our audiences are, of course, data geeks. IR is about the numbers – but more than that, our story is about the change in numbers, the trend that creates value for shareholders. Flat lists of numbers hardly do justice, sometimes, to the powerful drivers of performance for our businesses. We should always be on the hunt for clearer, easier to grasp, more persuasive ways to communicate data on the markets for our products and services, not to mention the financial trends that influence our stock prices. To the extent that investors “get it,” they invest. 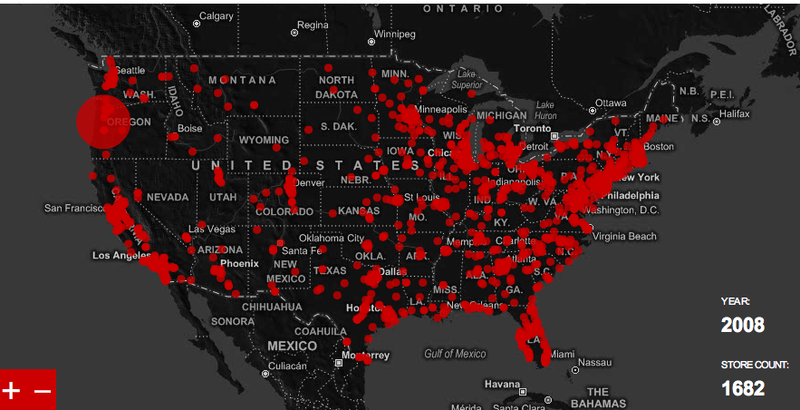 Living maps – WalMart or Target‘s amazing growth story starts with a single store and expands to fill up the continent, as the years tick by. Instead of showing a static map of locations on a slide in a Powerpoint, or a simple map on your website, go dynamic with a map that comes alive. Bubbles – Discs on a graph, by their size and positioning, communicate a lot. Have a look at this post on US market shares of beer – you see at a glance who the winners are and by how much (unless you’re an upscale beer snob, ignore his comments on Bud, Miller and Coors). To go hyperactive with bubbles – and leave numbers behind – check out Nathan’s moving graph of people’s hopes and dreams as expressed on social media site 43things.com. Choosing a chart – Ever wonder which kind of chart to use? Nathan links to a decision-making flow chart in a PDF file from the Extreme Presentation blog. How not to do it – FlowingData offers six amusing tips here on how to make an ordinary graphic really, really ugly. Blogs on presenting data – A page full of links offers a jumping off point for exploring dozens of viewpoints and how-to sources on visualizing data. FlowingData doesn’t focus on financial information, though it has some economic content. For example, the humble bar graph isn’t explored much. A staple of data presentation for investors, many bar charts could speak more persuasively if they had movement to show growth over time – or even just better labels and scaling. My point is simply that IR people need to be thinking and learning about graphics. Visual tools are critical to communicating effectively with investors – and we should be sharpening our craft, even as we keep up with the numbers side of IR. At the intersection between numbers and art, we should be lifelong students. A few other sources to stimulate your visual thinking: The Wall Street Journal Numbers Guy blog, anything by data graphic guru Edward Tufte, By the Numbers blog in The New York Times, and the Extreme Presentation website. Do you have a favorite source of ideas for graphics in IR? Share a comment. As investor relations professionals, we need an audience-centered approach to communicating with investors. And the audience, more than ever, is online. So we need to think strategically about our company websites and their IR sections. Do they deliver what investors need and want? Do they accomplish what we want? Think of a corporate website as a place that people experience. When an investor comes to your home page, it’s like a prospect stepping onto the front porch of a house you’re trying to sell. The investor looks in the front door, takes it all in, and prepares to go in and walk around. Other sections of the site are the rooms. Finds information – which, of course, is why he’s there. Forms impressions – your company brand comes across in many ways. Interacts in some way – which may be your one chance to engage. We should evaluate our websites in terms of these experiences for our audience – what they’re looking for and what drives value in their minds. Over the years, I’ve worked on corporate websites to benchmark best practices for what IR content should be there, and I’ve done a good deal of writing for the web. The strategic IR focus for a website looks at whether we are delivering the right information for investors in easy-to-find, usable forms, creating the right impressions of a company committed to creating value for shareholders; and inviting investors to interact with the company in convenient and helpful ways. The IR purposes of the website must integrate with other goals – marketing, recruiting and retention, public affairs – because all of these audiences overlap. A corporate website must integrate with offline sources of information – the print reports, SEC filings, product promotion, media releases and so on that all of these audiences also see. Tactically, we can do a great deal to maximize the value of our websites to investors. My own “audit” checklist for IR websites has about 40 potential features or content items. But checking off information items isn’t the main point. The experience of the investor when he or she comes to this place – your front door – is the main point. The switch that unleashes the power of communication is making it personal – and this applies to corporate websites, blogs and social media – author and communications prof David Perlmutter says. Perlmutter studies and blogs on political communication and wrote Blog Wars: The New Political Battleground, which came out early in 2008 chronicling, among other things, the superior online presence of Barack Obama’s campaign for President. I went to Perlmutter’s lecture on business blogging today at the suburban Kansas City campus of the University of Kansas (where he teaches). The mark of a great communicator, Perlmutter says, is that a member of the audience comes away saying, “I felt like he was talking to me personally.” Without the human connection, talk is just noise. So it is with corporate forays into interactive media, Perlmutter says. The goal is mass communication, but the voice must be personal. “I have seen a lot of corporate blogs and, boy, they read like corporate blogs,” Perlmutter says. “This is something that big institutions have trouble figuring out how to do.” Finding the right voice will be different for every company, but it will certainly take some thought. For investor relations people looking at what I call IR 2.0, strategic thinking is a critical first step. Technologies like blogs, podcasts, vodcasts and Twitter enable everyone from the CEO to workers on the shop floor to tell the company’s story. And often their voices, real and unrefined by the corporate PR machine, have much more credibility than sanitized, over-massaged press releases. … if you want to give your company an edge in this market, you’d do well to remember that investors are also buying into a business run by real people. Get those people out in front of investors, not just in person in small group meetings or one-on-ones, but out on the web as well. My thought is that IROs might take advantage of a depressed time (and the CEO/CFO’s reluctance to go on the road and meet depressed investors?) by moving forward with IR 2.0. Dominic’s blog archive is a good place to start researching more interactive forms of communication – and preparing a case for management and legal to embrace the trend toward online IR. But companies can fight back against negative publicity online, with the right know-how. The 2009 Search Marketing Benchmark Guide by MarketingSherpa explains how a major bank reacted to a highly ranked site attacking its reputation. The bank contacted other sites linked to the negative one and got them to de-link, lowering its importance to search engines like Google. In addition, the bank added lots of search-optimized content to its own site – like blogs, videos and press releases – to fill up more of the top spaces in search listings. As a result, the offending site was knocked from the top page of results. Good commentaries on the SEC guidance on corporate websites, blogs and the like at two other blogs: TheCorporateCounsel.net and IR Web Report. The devil is in the details, of course, so you’ll want to study the SEC’s interpretive release (update: the full release was posted on August 1). 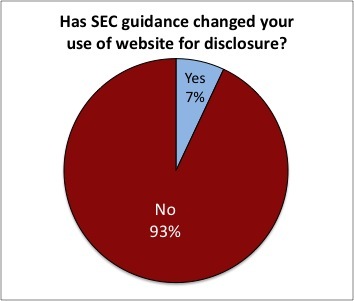 The Securities and Exchange Commission today approved new guidance for public companies’ communication with investors via websites, blogs and other Internet channels, a long-awaited update for investor relations officers and executives who last heard from the SEC on this topic in 2000. Use of websites to comply with Regulation FD requirements. The SEC promises guidance on how companies may disseminate updates or material information online, without the well-worn ritual of issuing a press release to make information “public.” The interpretive release will go into particulars on how companies can evaluate whether (1) their websites are recognized channels of distribution, (2) posting online makes the information available to the marketplace in general, and (3) investors and the market have time to react to the information posted. Details will be of interest to IROs as well as PR staffs and vendors. Liability consequences of online financial communication. Specifics include corporate websites’ provision of data in historical archives (without considering an old news release or financial report “reissued” every time someone accesses it); links to third-party websites or reports (updating the SEC guidance on disclaimers to avoid “adopting” the other persons’ views for liability purposes); and summary or highlighted information (imagine a brief overview of financial reports, without rehashing all the notes and disclaimers in the 10-K). Blogs and online forums, a hot topic among IROs eager to interact with investors in a 21st-century way. The SEC affirms that antifraud provisions of the securities laws do apply to statements made by companies or persons acting on their behalf in these venues. (In my book, this is the only sensible approach.) And companies can’t force investors to waive protections as a condition of entering such a forum. Sarbanes-Oxley and the website. The guidance cuts companies a little slack by discussing boundaries so that not all information that might appear online (many company websites offer areas for marketing, recruiting and other purposes as well as investor info) is subject to Sarbanes-Oxley rules on disclosure controls and procedures. Cool graphics. The SEC gives the go-ahead to creative technologies that use video or interactive features but aren’t “printer-friendly.” Apparently it doesn’t have to be on paper to be disclosure. It’s great that the SEC is responding to this need for clarity, following a recommendation from its Advisory Committee on Improvements to Financial Reporting. Companies will want to study the guidance to implement best practices, and stay legal, as investor relations enters the era of IR 2.0.